Now that 20 years have passed since the TRC undertook the complex task of promoting national unity and reconciliation, it is an opportune moment to reflect on its legacy. In an as yet little known book, The Impossible Machine: a genealogy of South Africa’s Truth and Reconciliation Commission, published in 2013, Adam Sitze targets much of transitional justice’s historical amnesia when it comes to the juridical forebears of the TRC. Sitze argues that the TRC was not by any means an entirely novel, unprecedented institution of transitional justice. Rather, it had its perhaps counterintuitive precedents in “colonial sovereignty and governmentality”. By this Sitze means that the TRC has a hidden history in the colonial and apartheid governments’ emergency jurisprudence. He considers two juridical institutions — indemnity and the Commission of Inquiry — as providing the TRC with its original conceptual apparatus. Sitze argues that the legal concept of indemnity emerged as part and parcel of the jurisprudence of parliamentary sovereignty of the English Constitution. Indemnity functioned to reconcile two meanings of sovereignty (which were at times opposed) in that jurisprudence: legal sovereignty (or the rule of law) and political sovereignty (“the safety of the people is the highest law”). Indemnity recognised that state officials could, at times, act in an illegal way to protect the safety of the people. It would then be legitimate for the sovereign to legalise the illegal conduct of its officials if it was convinced that such conduct was undertaken in good faith and was necessary to protect the people as a whole. Indemnity was formulated as an unwritten, legal convention of sovereignty in order to underscore that it was only in the most exceptional of circumstances that a sovereign could effectively breach the rule of law in the name of political sovereignty. However, Sitze argues that the colonial and apartheid governments abused this exceptional power of sovereignty in that indemnity became a routine aspect of colonial and apartheid governance. At least since 1912, when indemnity was written into the then Police Act, its integration into the South African legal system functioned to “dissolve the intricate balance” between law and convention. This meant that indemnity entered into crisis: no longer did it function to reconcile legal sovereignty with political sovereignty. Instead, it started to function as a form through which the distinction between legal and political sovereignty was altogether obliterated. I believe that Sitze’s discussion reveals not simply that the routine recourse to indemnity in apartheid South Africa destroyed the distinction between political and legal sovereignty. Rather, indemnity erased the very distinction between “colonial sovereignty and governmentality”. “Governmentality” is the term for a paradigm of the exercise of political power, coined in the late work of Michel Foucault. It is a form of power that includes strategies of sovereignty, administration and discipline. Foucault argued that governmentality emerged during the eighteenth century when Power started to direct itself at the totality of questions that pertain to the life and welfare of the population. Foucault called this new direction of power “biopolitics”. Now if we look at the dualistic structure of parliamentary sovereignty (legal and political) we find that a biopolitical imperative — the “safety” of the population — resides in the innermost core of sovereignty. And it is intricately bounded up with the notion of the exception, since the justification for a suspension of the rule of law and the declaration of a state of exception (or “emergency” as it was known in apartheid South Africa) is always the safety of the people. When indemnity and, along with it, the state of emergency (declared or not), became a routine part of governance, it effectively meant that biopolitical considerations started to override legal sovereignty. And since indemnity was abused to the point that the distinction between political and legal sovereignty became unintelligible, it meant that governmentality effectively became the dominant paradigm of colonial and apartheid rule. Sitze nicely draws out the implications of this conclusion: “Where the rule of law no longer constrained the biopolitical — where repeated legalisations of illegality dissolved all distinctions between the sovereignty of law and the political supremacy of white populations — biopolitics no longer remained identical to itself either. Biopolitics, unconstrained by the rule of law, imploded into a kind of race war.” Why “race war”? Because the “safety of the people” that was enlisted to justify the state of emergency (and the consequent granting of indemnity to its officials by the apartheid governments) was always only the safety of a certain minority of its population, its white minority population. Sitze ultimately argues that the TRC’s amnesty power represented a “final” form of indemnity in South Africa. Pointing to the fact that it was immediately preceded by a whole series of indemnities for apartheid state officials, including the defence force, amnesty was from the outset understood to be a classical attempt “to provide retroactive protection from civil and criminal prosecutions to those who violated the laws passed by the apartheid state’s own sovereign parliament”. Sitze argues that this operationalisation of indemnity by the TRC was, in fact, genius: it used the very institutions of emergency jurisprudence as the “juridical basis” upon which to build an exposure and critique of the inhuman acts that were committed under and in terms of that very emergency jurisprudence. However, Sitze also argues that there was a profound risk involved in using the tools of the decommissioned master’s house in this way and that the TRC was not sufficiently attentive to this risk. The risk was that it would reiterate without a difference the very jurisprudence which it sought to undermine. There are three criticisms in this regard that could be levelled at the TRC’s Amnesty Committee. First, the Amnesty Committee dropped completely the “evaluative or normative dimension to the ‘proportionality’ requirement” which played a decisive role in the question whether an act (in the legal sense) qualified as one committed with a “political motive”. Instead, the committee opted for “nonnormative, descriptive distinctions between political objectives and nonpolitical objectives” and accordingly routinely decided applications for amnesty on the basis of the applicant’s “bona fide belief in the necessity of a given illegal act”. In dropping the normative dimension of proportionality, Sitze argues that the Amnesty Committee reiterated without difference the indemnity jurisprudence from the apartheid era. How so? Because, as Sitze (2013:107) indicates, the “necessity” test for indemnity during the apartheid era, became precisely, a subjective test: whether the official concerned honestly believed that the act was necessary to preserve or restore the safety of the (white) population. In point of fact, it was apartheid indemnity’s restriction of itself to this test alone that caused the indemnity convention to enter decisively into crisis. Thus, in restricting itself to the question of the applicant’s bona fide belief, the Amnesty Committee allowed indemnity to silently survive in its practice. The second criticism relates to the “full disclosure” requirement. Similar to the approach to proportionality, the “pivotal criterion” in the “full disclosure” test became whether the amnesty applicant furnished an “honest” account of the crime. Sitze notes, further, that the individualised approach as such undercut a fundamental aim of the TRC, namely to “narrate, as the common sense of the postapartheid state, the retrospective history according to which apartheid as a whole was a crime against humanity”. The interpretation of what would be taken as “full disclosure” that followed from the individualised approach put the Amnesty Committee at odds with “the manifestly shared or common character of the political crimes it was charged with adjudicating”. It meant that amnesty applicants did not have to disclose their complicity in crimes in relation to which they had not applied for amnesty. Sitze concludes that the Amnesty Committee’s preferred, individualised, honesty-driven approach to full disclosure, precluded the committee from obtaining disclosure in relation to a vast number of acts in which amnesty applicants were complicit. And this approach severely constrained the normative force of the “full disclosure” requirement. This brings us to perhaps the most important commodity in the TRC’s normative economy: reparation. In a sense, we all know what happened in relation to reparation. That the TRC could only make recommendations to government in respect of reparation was, of course, one of its central weaknesses in terms of enforcing the normative economy in which it nevertheless dealt. We all know how the Thabo Mbeki government responded to the TRC’s robust recommendations that not only the state but indeed all beneficiaries of apartheid were responsible for reparation. However, to put it in Sitze’s words is to understand how the TRC was forced into a reiteration of indemnity jurisprudence without a critical difference: “The Mbeki administration’s response to the TRC’s proposals ruined the TRC’s ability to differentiate itself” (Sitze 2013:119). The TRC, in Volume 6 of its report, went as far as acknowledging for itself that what it called its “international legitimacy” (not to mention, presumably, its national legitimacy) depended on “the provision of adequate reparations” to the victims of gross human-rights violations. 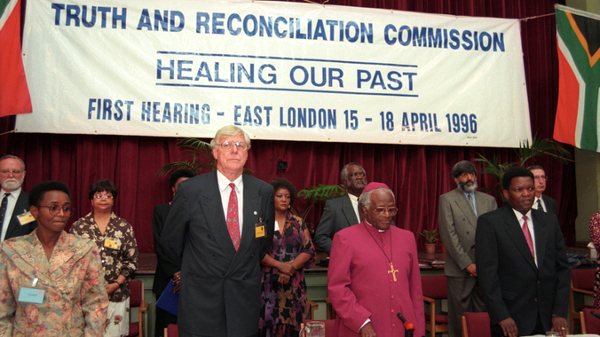 “Amnesty”, the commission wrote “without an effective reparations and rehabilitations programme would be a gross injustice and betrayal of the spirit of the Act, the Constitution and the country” (TRC Report 1998:110). It turns out that the “new”, post-apartheid, neoliberal paradigm of governmentality exerted considerable force in relation to the TRC, which itself was inadequately attuned to the biopolitical risks of its endeavour to obtain truth through amnesty. What the analysis suggests is that governmentality remains as bounded up with sovereignty as it was during the apartheid era; as bounded up as it conceptually and constitutively is. This is not, on its own, then, an indictment of the TRC. But it does constitute a renewed warning that governmentality, if not reined in by constitutional sovereignty, can have catastrophic consequences.